For those that know me, it's no surprise that I consider myself a "rocker chic". I own a collection of rock band belt buckles. Yeah, I'm that obsessed. If I could go back in time, I would be best friends with Robert Plant. 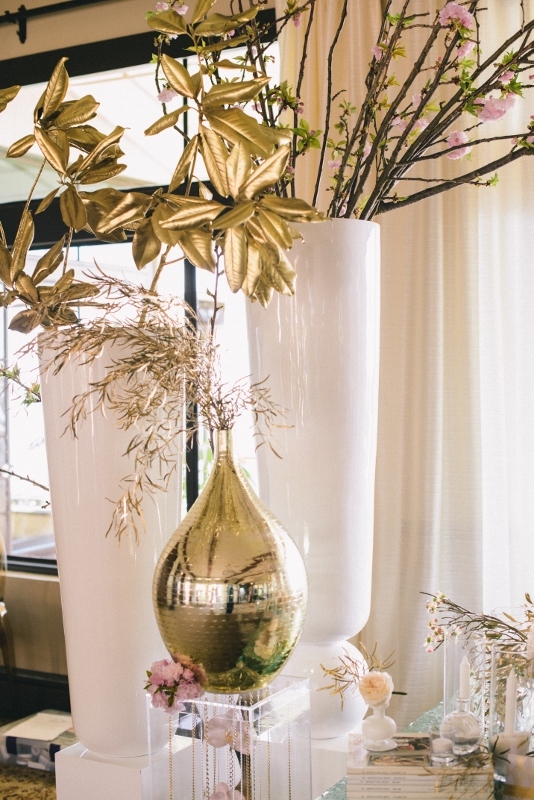 That's why when one of our favorite wedding planners Trina Schmidt of Trina Schmidt Weddings asked us to design the florals for a Glam Rock couple, we screamed YES! As if doing a wedding that allowed us freedom of creativity wasn't enough, it's been featured in Offbeat Bride. 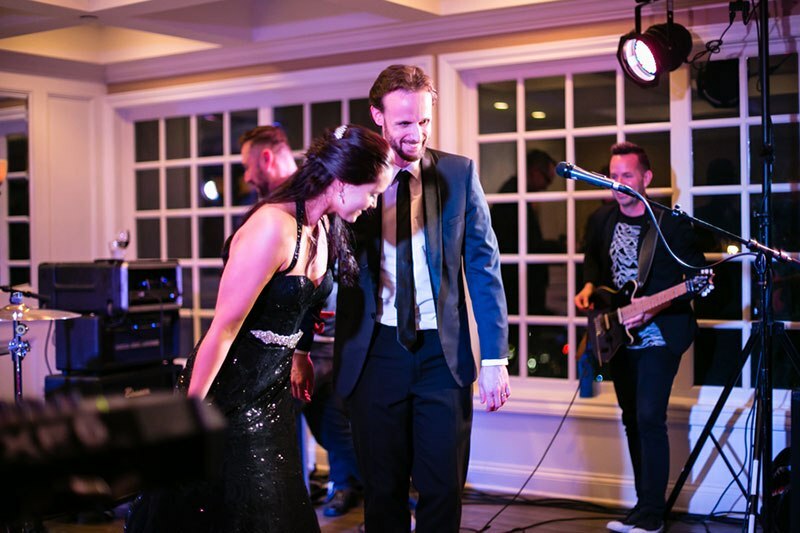 Lauren and Bryan love heavy metal and wanted to incorporate that love into their wedding celebration. They chose black, purple and silver as the basis for their design. 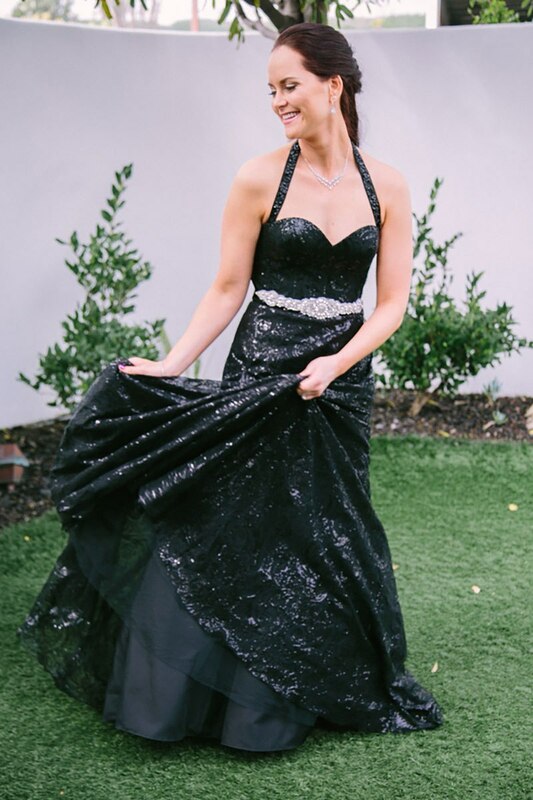 We applaud Lauren for being a rock star and choosing a black sequin wedding gown from WToo by Watters. 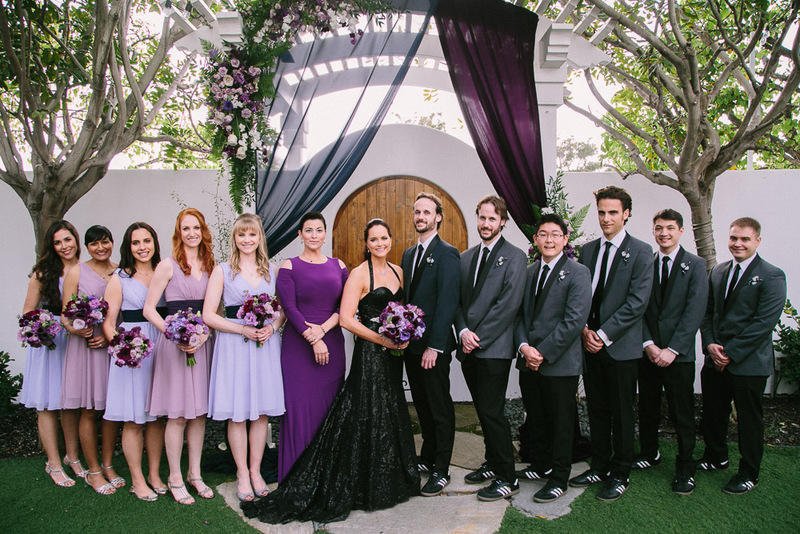 Her bridesmaids all wore shades of lavender and purple. 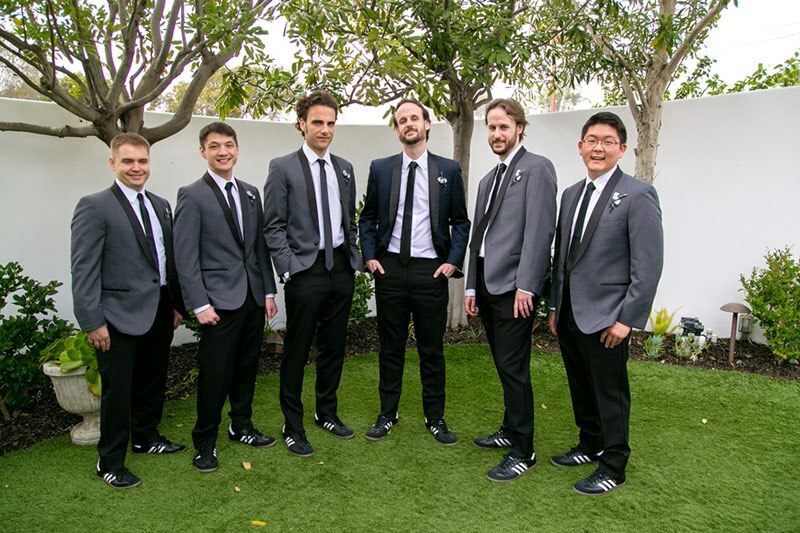 To keep it fresh and hip Bryan ad his groomsmen wore black and white Adidas and guitar picks for boutonnieres. Be still our rocker hearts. 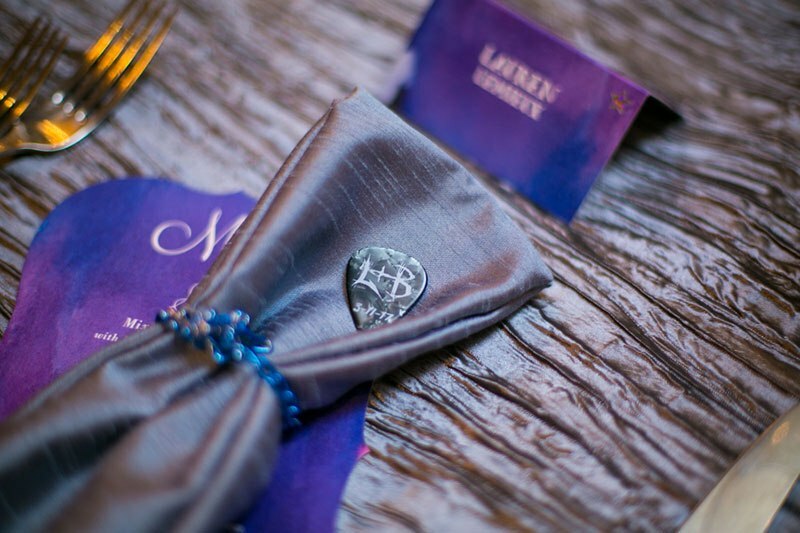 Knowing all the little details that Trina had planned with the couple such as invitations that looked like concert tickets, and table designations of album covers from their favorite bands we knew the direction we had to go in. When designing for a wedding that's outside of the box, we always keep in mind that it should still feel elegant. We used metal stands brimming with flowers full of texture and color that aren't your standard wedding flowers. Our choice was roses, stock, sweet peas, scabiosa, tulips and cosmos, just to name a few. 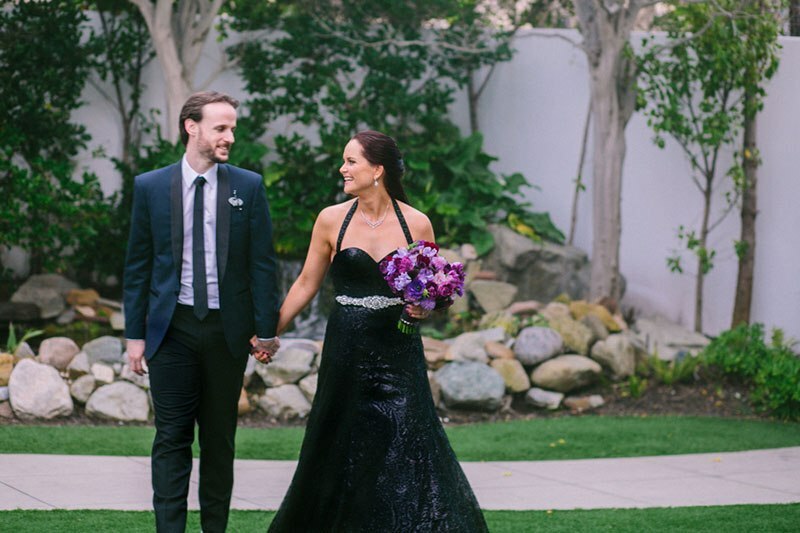 We love that the couple chose to become one under a canopy of black sheer fabric. 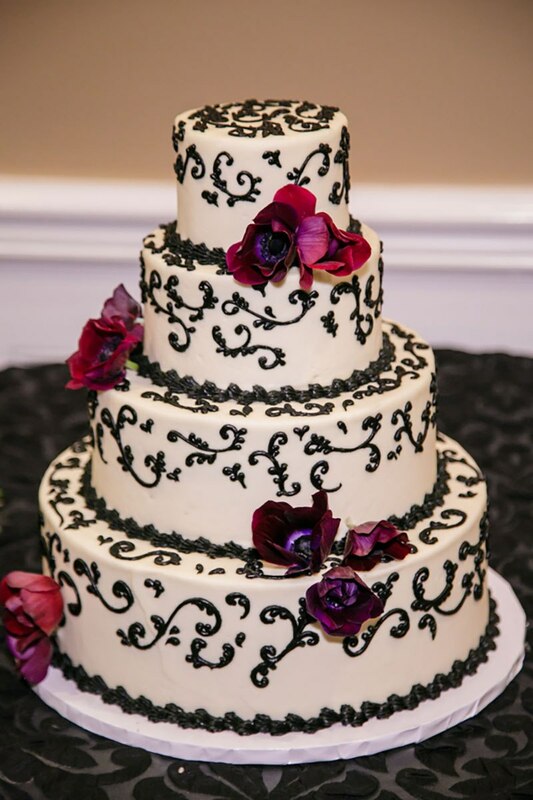 We used only a touch and added a floral cascade to keep it soft and romantic. 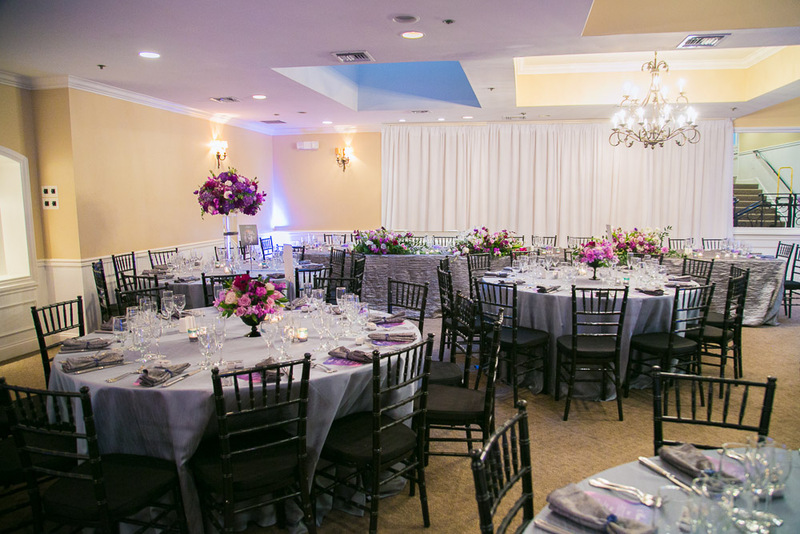 For reception we chose silver and gunmetal linens with lush floral in a high and low style for a dramatic effect. 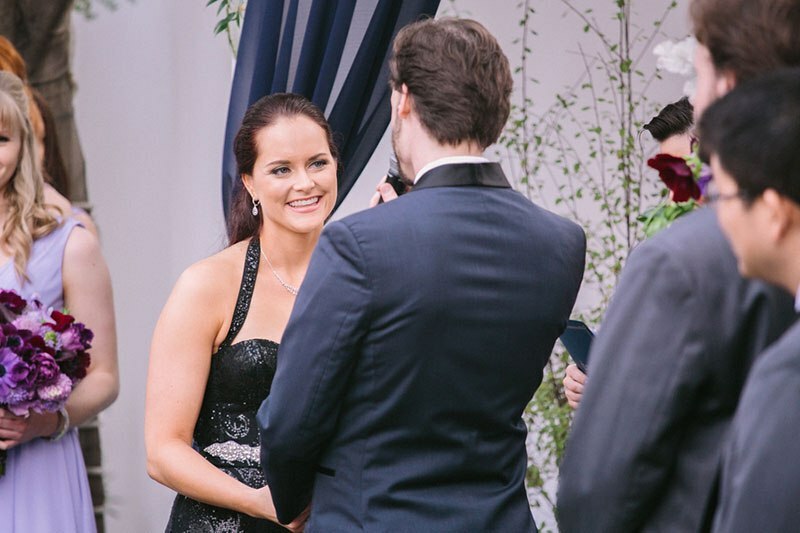 Overall the look was bold yet luxurious to the delight of our couple and their guests. 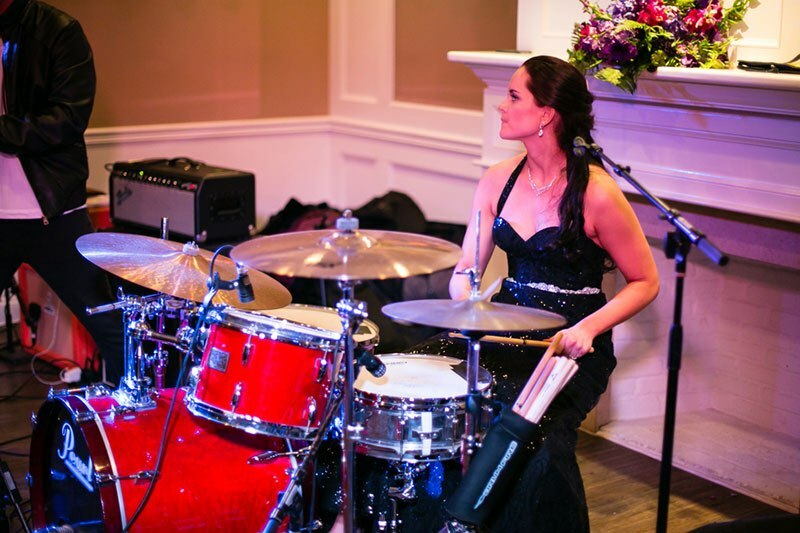 We love working with venues and vendors who share our values. 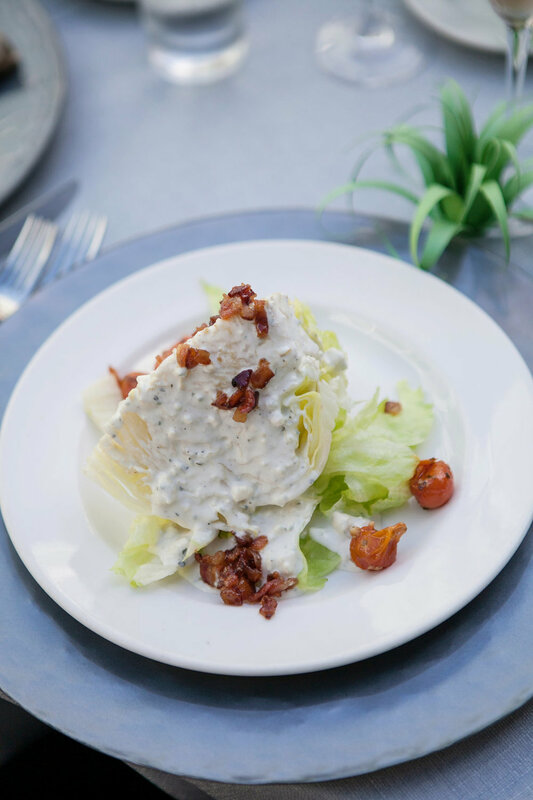 We believe in leaving a smaller carbon footprint on the world we love. 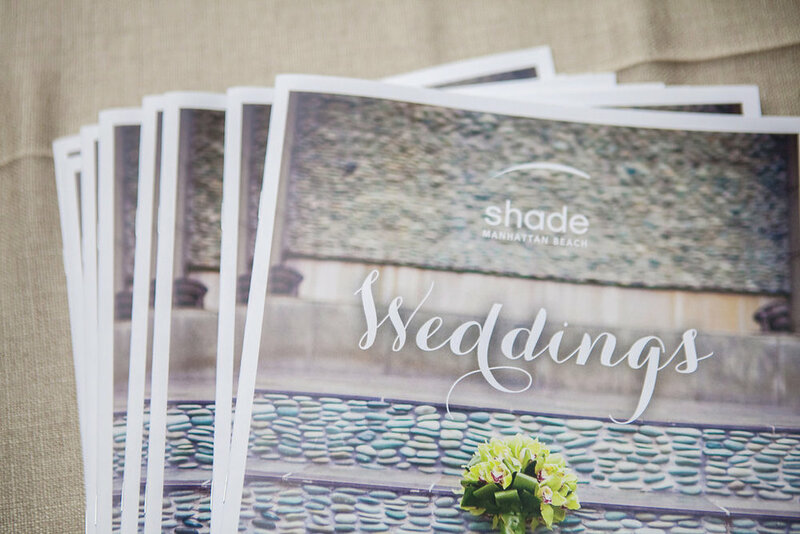 Shade Hotel in Manhattan beach does as well, and asked us to be part of an event that shared tips and tricks for the industry to do just that. 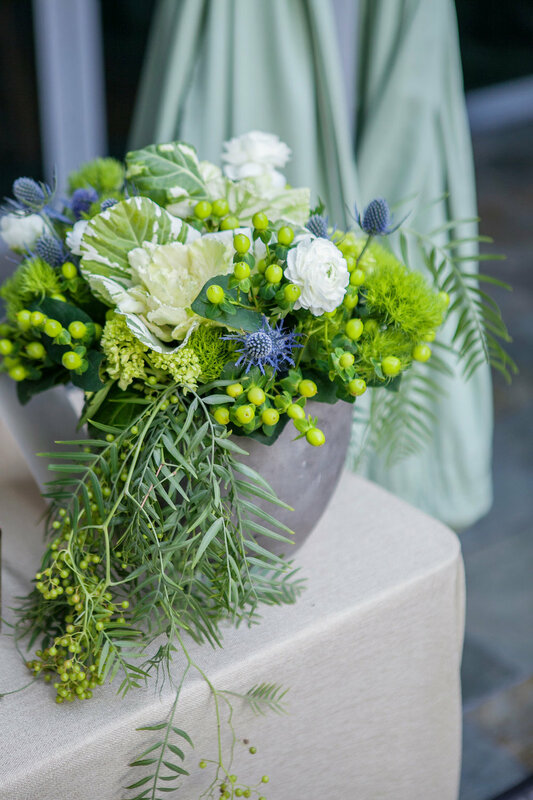 They held an Eco Chic Luncheon and we provided all the floral decor. It was an intimate luncheon with 30 event professionals enjoying the beautiful courtyard at this modern beach hotel. We used a combination of crisp white orchids, air plants, succulents and other living plants for our design. It was important that we stayed in keeping both with the theme of reusable decor and the amazing succulent wall that is a showpiece of the courtyard at this charming hotel. To keep things interesting, we used many different types of vessels. This is a great way to keep guests engaged with what is happening the table. Their eye wants to see the multiple colors and textures and embrace them. Shade Hotel hosted this event to show us how they are making a difference and how we could too. There are two Shade Hotels, one in Manhattan Beach and another in Redondo Beach. They have started a new program allowing guests to opt out of housekeeping services in exchange for planing a tree in their name. All of the event sponsors rose to the occasion for this luncheon. Russian Standard Vodka provided a Bison Grass Vodka that is sourced from organic farms and contains no pesticides. Calligraphy Katrina introduced her new line of rentals that can be used again again for signage and table designations, decreasing the amount of paper that's used in weddings. 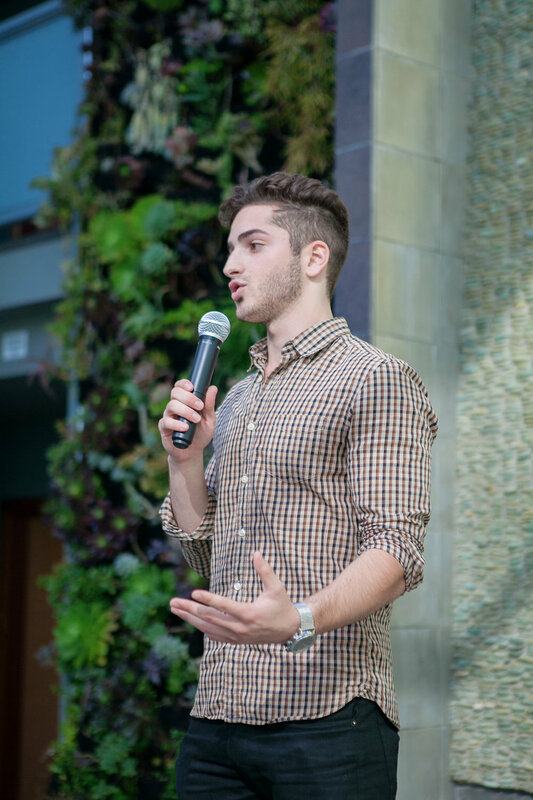 While we enjoyed an amazing meal, we listened to speaker Kai Cohen of Green Concepts. His company works with caterers, venues, and wedding planners to pick up all waste from events and recycles them. They even take your wedding flowers and donate them to local nursing homes and hospitals. Now that's something we can get behind! We learned so much about how to be better stewards of the environment and we can't wait to share those resources with you. Being a floral designer in Southern California offers us many opportunities to work at unique venues. Recently such an opportunity presented itself at The Bachelorette House in Malibu. This house is famous for it's presence on the wildly popular television show The Bachelorette. 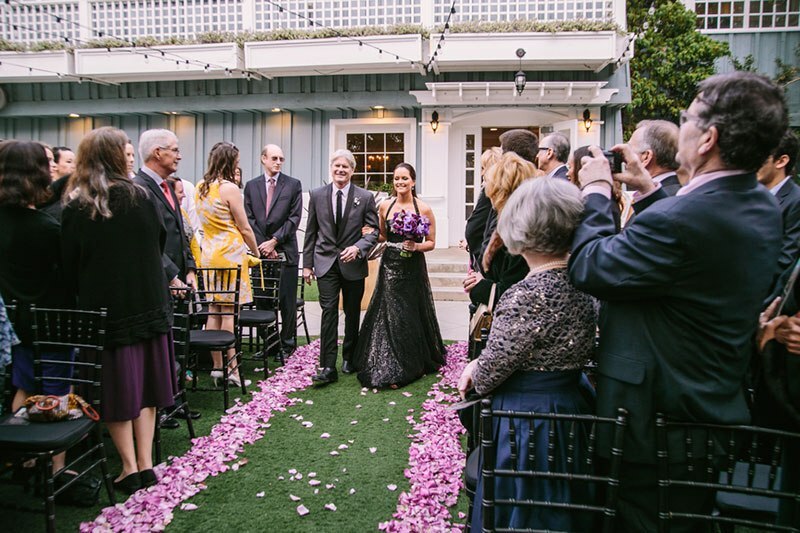 Our dear friend, colleague, and wedding planner, Tessa Lyn of Tessa Lyn Events asked us to design the florals for this beautiful wedding. The house itself is modern and contemporary, with the Pacific Ocean as the backdrop. With the couple's color scheme of white and ivory in mind, we created a sleek and modern ceremony design to match the property. We're happy to share some of the photos of our designs. 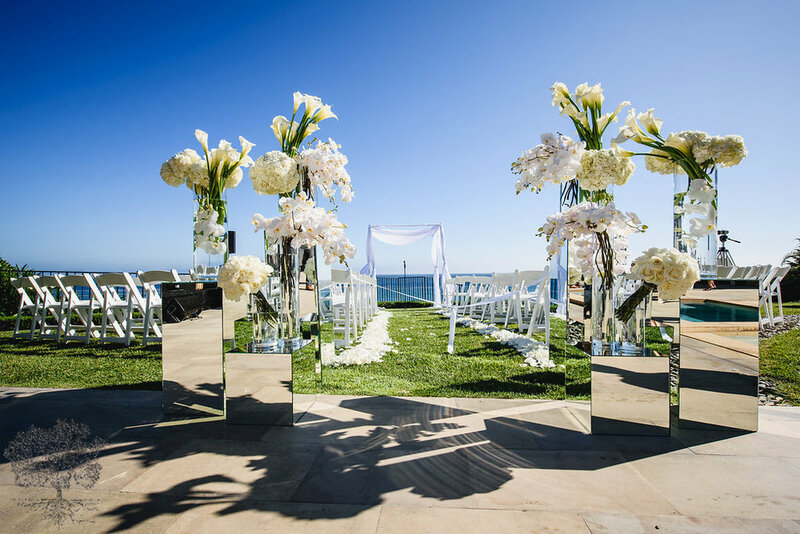 The focus for the ceremony was clean modern lines, allowing the ocean to be the star the show. We achieved it through the use of White Calla Lilies, Ivory Roses, and White Orchids, in a pave' style, place in interesting angles in glass vessels. The arrangements themselves sat atop mirrored columns in varying heights. For a romantic feel, petals defined the aisle in a clean and compact style. We hope you enjoy the images by Viera Photographics as much as we do. It was a magical day. As far as the eye could see, was blue sky and blue water. Our white palate was a stunning contrast. Creativity is our life blood. We live and breath design. Every event that we do, whether a wedding, a corporate event, a social event, they all allow us to create something new and different. There are no cookie cutter events in our arsenal. When colleagues in our industry stand up and take notice of our design work, it's so fulfilling. Remember when Sally Field won the Academy Award, and she said "you like me, you really like me"? Well that what industry recognition feels like. 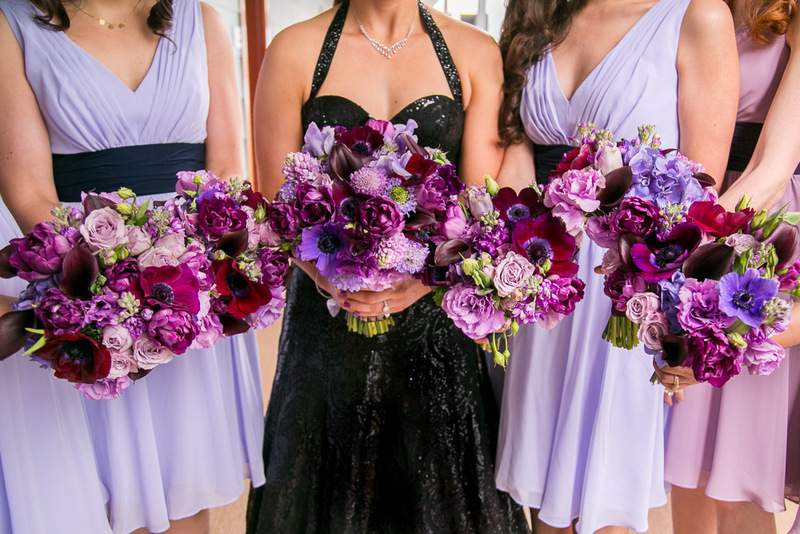 Allow us to share that moment with you through these stunning images from Krista Mason Photography. Our friends at Luxe Linen asked us to design a tabletop using a linen from their new collection. 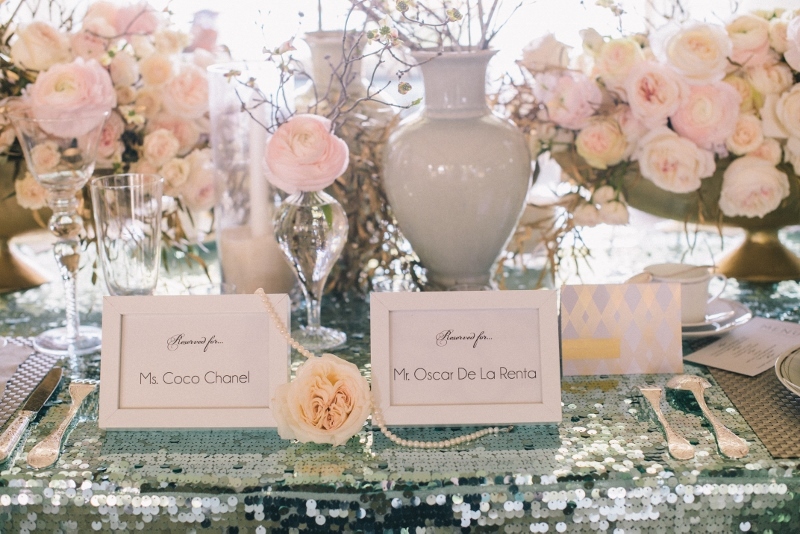 They hosted a party at the spectacular Bel-Air Bay Club, presenting their new collection to the event industry. Teams were chosen to create design themes based on a specific linen. 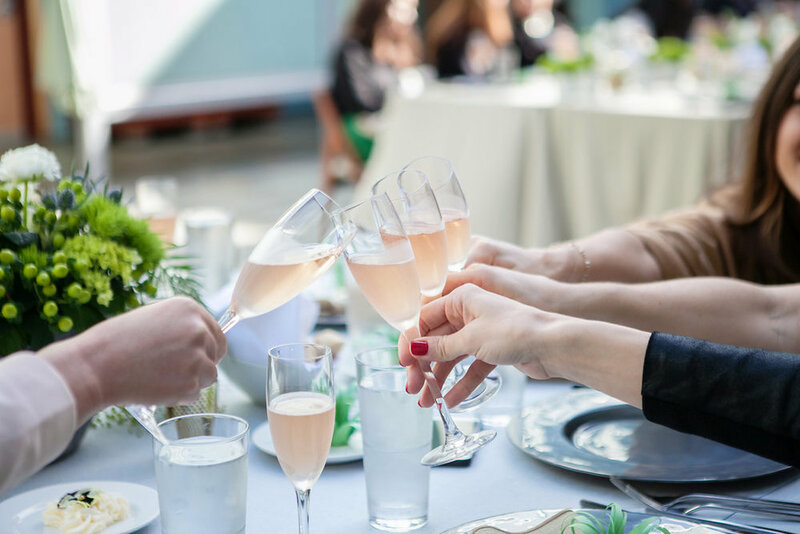 We were partnered with Nam Lam of Modern LA Weddings, who we work with often. Together we designed a luxurious atmosphere that would be fit for designers who inspire us, such as Coco Chanel and Oscar De La Renta. Only the finest would be suitable if these two icons were sitting down to dinner together. The basis for the entire design was the linen. 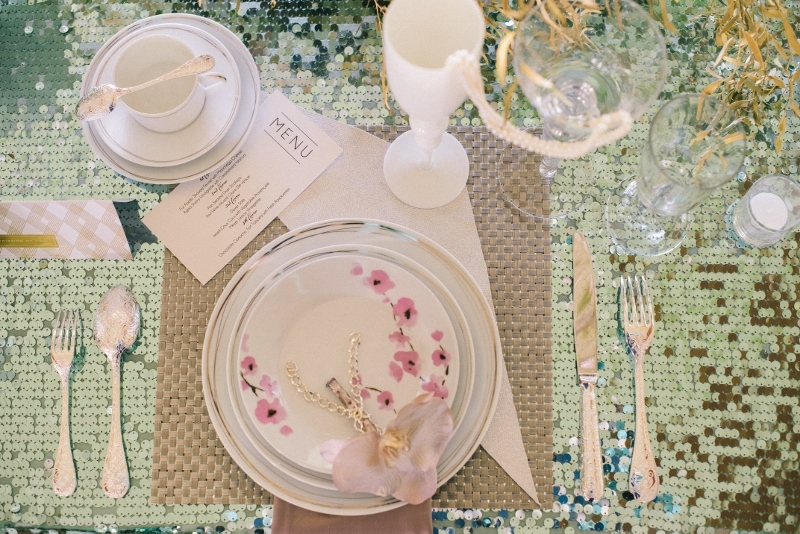 It's a mint green sequin linen that has characteristics of metal and fluidity. The statement screams high fashion, glamour and drama! Softness was required to tame that strength. Our centerpieces were in elongated, gold, footed vessels, to span the width of the table. 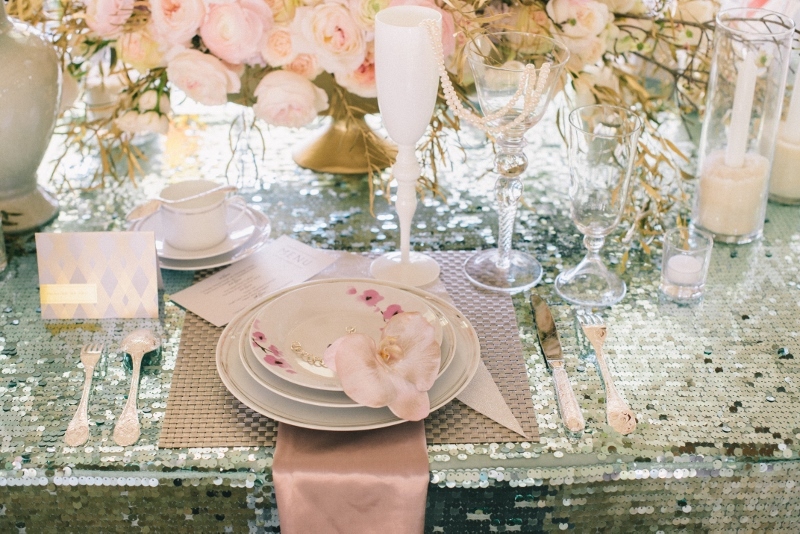 We wanted them to feel lush and romantic, so we filled them with flowers in shades of blush and pink for a soft contrast against the sequin linen. We chose roses, rununculus, tea roses, dripping onto the table itself. When Nam and I design together, we like to do "the unexpected". For instance we used several styles and colors of vessels on the table and surrounding pieces. Gold, sliver, grey, white, all come together to compliment the overall look. These items don't compete with each other, instead they compliment each other. For height and drama we filled vessels with dogwood and cherry blossom branches. 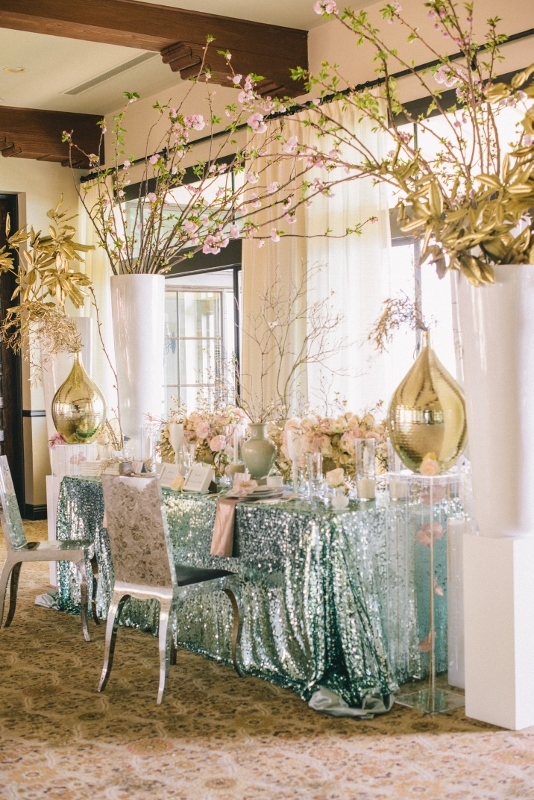 To frame the tables, white columns were filled with gold sprayed willow, eucalyptus, and magnolia branches. Final touches included pearls and chains. And what about those chairs? They were silver engraved chairs, from none other than Cristofle....adding that final touch of ultimate luxury to the table. 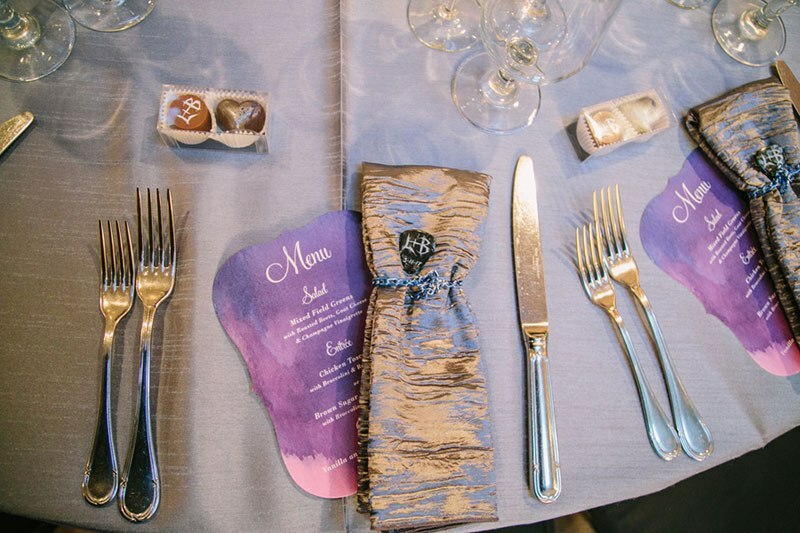 We enjoyed seeing all of the tabletop designs, but we can't deny that magic happened that night. Our table stole the show. The design was featured in the Xaaza Blog, and we hear that a publication or two may feature it as well. When we look at the table in it's entirety, it evokes a table for French nobility in Versailles, but with a modern, fashion forward flair where Coco Chanel would feel right at home. A special thank you to Luxe Linen for choosing us to be part of your beautiful event. It was a pleasure to be inspired by your amazing linen. Also my love to Nam Lam. We love making magic with you! High on a bluff in Palos Verdes with the beautiful Pacific Ocean in the distance, sits the stunning ceremony site at Terranea Resort. 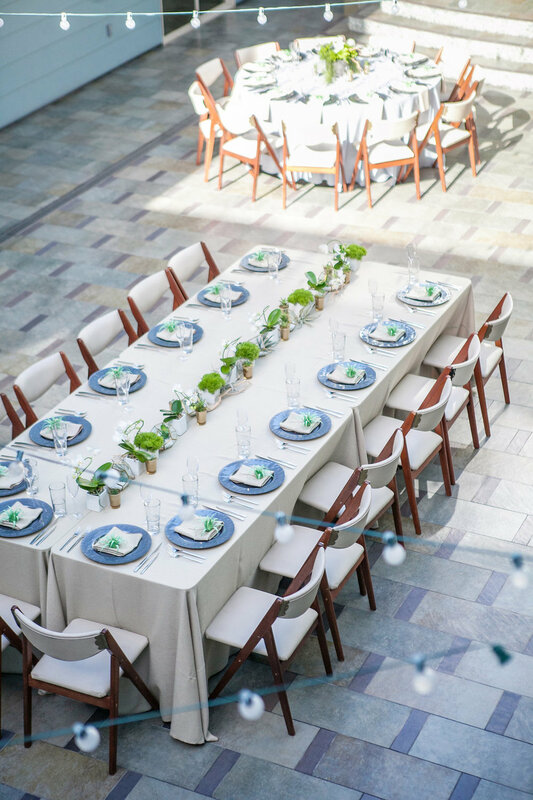 Wedding planner Carol Grogan of Bright Blue Events and our couple Layla and Robert wanted a luxurious design, that would reflect a contemporary sophisticated aesthetic. 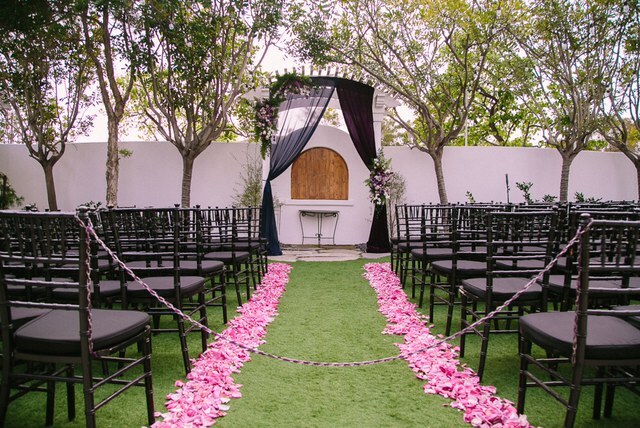 The ceremony space has it's own natural beauty, so we kept the ceremony design simple and classic. In addition to adorning the existing lattice structure with and abundance of flowers, and the grooms Talit , we draped it with billowy white fabric that blew gracefully in the breeze. After all the couple are the star of the show. In the ballroom we utilized tables in a mix of round and long. The long tables had mirrored glass tops, and we used a combination of tall and low arrangements. Some were in glass containers and others in mirrored containers. 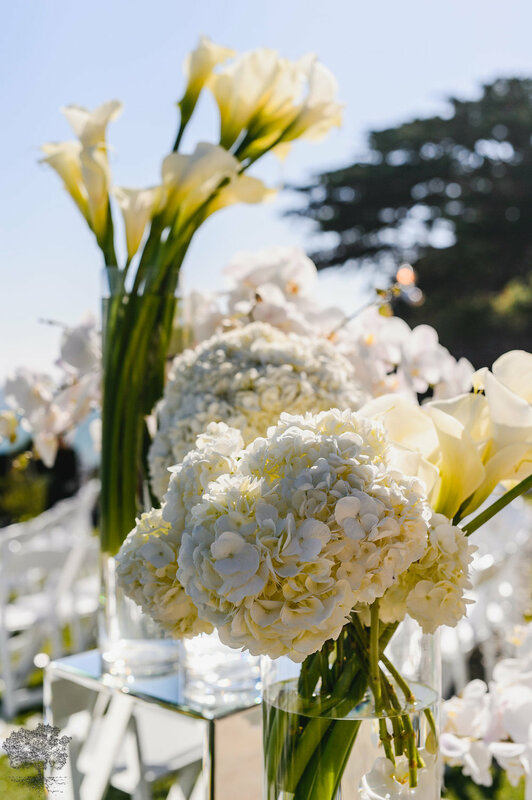 The arrangements were fresh and lush with hydrangeas, roses and orchids in white, cream and champagne. A pop of hot pink livened up the entire design.It's always a pleasure to work with Bright Blue Events and the staff at Terranea. Every time we look at these images, we're reminded of what a perfect day this was. 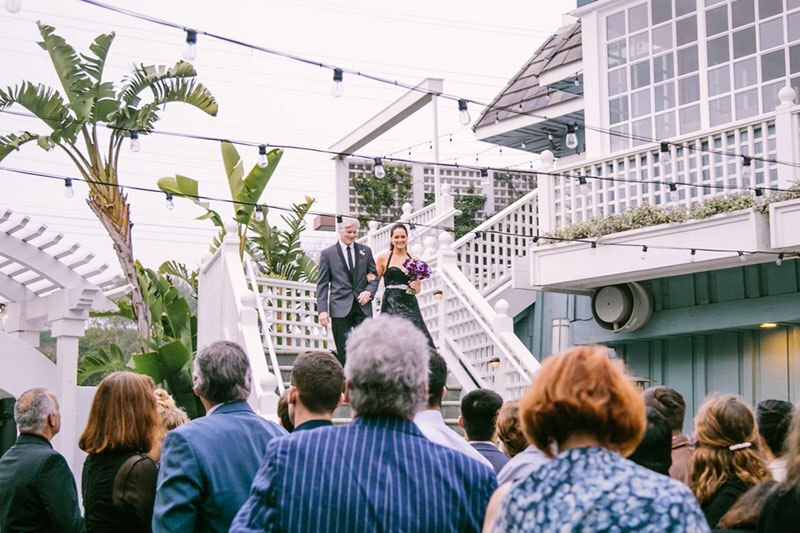 Los Angeles has unique contemporary spaces for weddings, and event designer and planner Nam Lam of Modern LA Weddings has a talent for find them and the clients who love them. 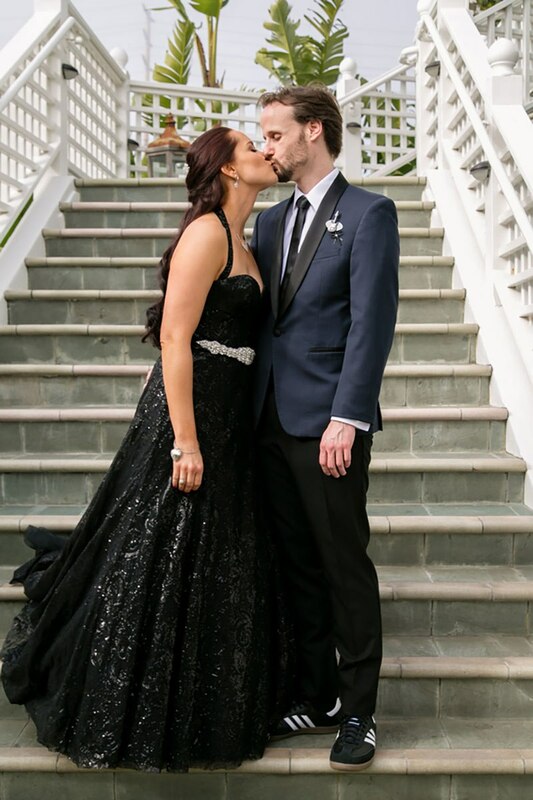 We worked together to provide Lauren and Mitch with the modern, minimal and colorful style they desired. Having the palette of loftSeven Penthouse matched our style to perfection. 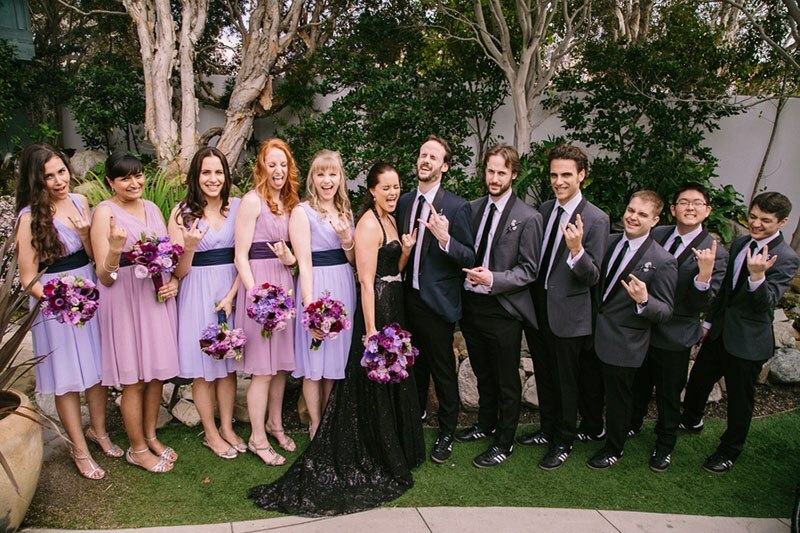 Our couple wanted a lighthearted approach to their wedding. It was important for them to make it urban, casual, yet beautiful. The photography of Justin Element Photography showcased the architecture of this unique venue. 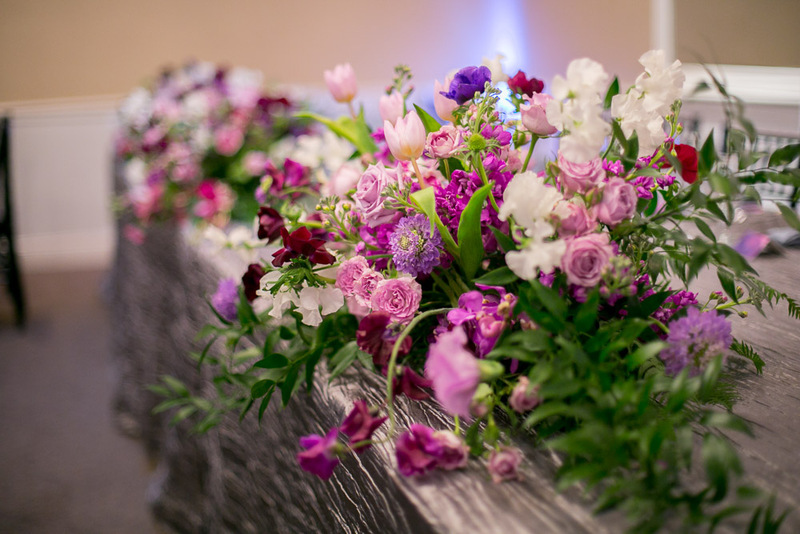 We enjoyed creating with a vibrant mix of orchids and other tropical flowers that gave the entire design an interesting edge.